The Skinny: Kelly Chen's Japanese Cinema debut is an incredibly well-produced romantic drama that's glossier than anything she's done in Hong Kong. She and Yutaka Takenouchi make an attractive pair, and the pathos is inherently compelling. However, the film is so superficially beautiful that it borders on sterility. 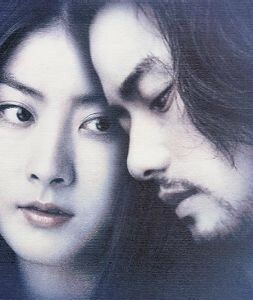 by Kozo: Like frequent co-star Takeshi Kaneshiro, Kelly Chen has long been popular in Japan. She has appeared in the Kyoko Fukada TV drama Don't be a Crybaby, and has gained popularity thanks to numerous print ads as well as her obvious physical charms. Now she co-stars with Japanese heartthrob Yutaka Takenouchi in Calmi Cuori Appassionati, a romantic drama set in Japan and Italy.